October 2004: Gary and I did not have offices at the same campus, which explains some of the following piece. For the rest, there really is no explanation. I am writing because of my concern about Dr. David Fleming. Over the past two weeks, his behavior has become increasingly erratic. Through the cubicle window, I can see him working feverishly at his computer. I don't think he even goes home anymore, because his car is always parked in the same spot, morning or night. I am enclosing a photo I took this morning. Gary: Ugh, those are the clothes I saw him in three days ago. Things are worse than I thought. Dave: I'm sorry; Dr. Fleming's office hours have been cancelled for today. Please leave a message at the sound of the beep. Beeeeeeep! Gary: That's it, I'm heading to Dearborn. Gary: Dave, step away from the computer. Dave: [sharply] Go away! Can't you see I'm working really hard? Must ... beat ... the Evil One! Gary: Oh no! He's gone Shatner on me! Dave: [now sobbing] Mother told me I'm a smart boy, why can't I beat him? Gary [calmly & slowly] Now, David, it's not that difficult...I can help you. But you have to have to WANT me to help you. Are you ready for help? Gary: [Sigh] Yes, David, Mommy's here, and she wants you to remove your hand from the mouse. I repeat, are you ready for help? Gary: Goooooood. The first step is admitting you need help. But first, go home and get some sleep. I'll meet you back here tomorrow morning. Gary: Now, "Pearls before Swine" is very similar to another game called "NIM," which I learned about when I was getting my master's degree. I can show you how to win every time. Dave: So you're going to explain the theory? Gary: No, I'm going to tell you how to win. One step at a time, Dave, one step at a time! Dave: Don't you think I can handle it? Gary: OK, how are you with binary code? Dave: Fine, just tell me how I can win. Gary: Take two pearls from the top row. Dave: OK.
Gary: Take three pearls from the bottom row. Dave: OK.
Gary: Take one pearl from the middle row. Dave: OK.
Gary: Now take the last two pearls from the bottom row. Dave: I win! Who's your Daddy, now, Evil One? Gary: Live the moment, Dave, live the moment. Dave: So, now I'm ready for "Pearls before Swine 2." Gary: Baby steps, Skippy, baby steps. Dave: You're right; I think that I'm getting ahead of myself. Gary: My 3-Step Program for getting people unhooked from "Pearls Before Swine" is a lot like a methadone clinic's strategy: we will transfer your addictions DOWN a chain of successively less-addicting games, until you are back to grading student papers. Dave: So what do I do now? Gary: Spend the next couple days catching up on your work and getting to know your family again. If things really start to get too tough for you, then you may go back and defeat the "Evil One," but only once per day. Dave: Hello, my name is Dave, and I am an online gaming addict. Dave: [Awed] Wow. How did it do that? [Whispering] It can't really read my mind, can it? Gary: No, Dave, there is no such thing as mind reading, although it would make for some very interesting meeting and campus visitations. I'll give you a hint — instead of focusing on just one card, focus on all six. Dave: Ah! So that's how it works. Gary: Yes. Although games are meant to be fun, they can also help us learn important critical thinking skills like pattern recognition and strategy. The not-so-cryptically named branch of Mathematics known as Game Theory focuses on determining if an optimal winning strategy exists, and if so, finding it. Dave: You mean some games don't have an optimal strategy for winning? Gary: You have obviously never been to Las Vegas. Also, in some games, like tic-tac-toe, the optimal strategy can only ensure a draw. Dave: You can't win tic-tac-toe??? Gary: I'm not counting the games against your 5-year old son, Lincoln; I'm speaking of two fully developed, reasonable opponents. Game theory is a fairly new field; in fact, one of the cornerstones of it is due to John Nash. Dave: Wasn't he the subject of the movie "A Beautiful Mind"? Gary: Yes, and if you're interested in his actual story then read the book instead. Dave: Ouch! So if I really want to win a game all the time, then I have to do a ton of research, and even then it still might not be possible? Dave: That's just too much work for me. Gary: Congratulations! That was the last step of my program. Dave: I now feel confident that I can safely play online games, but I don't feel that I have to. How can I ever thank you, Gary, for saving my job and my sanity? Please accept this check for $500, Buddy. Gary: I wouldn't think of it, Dave. It would be more than enough if you just gave me a penny today, two pennies tomorrow, and just keep doubling it each day for a month. Dave: Done, you're a true friend. Gary: You have no idea. 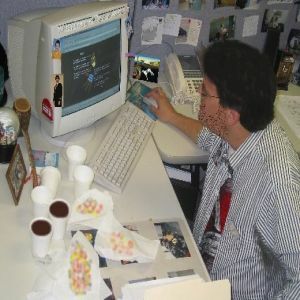 The above was a dramatization (No games were played during actual work time). All characters, even those based on real people, are completely fictional. No division chairs were harmed in the writing of this article.